The commercialisation of agriculture is pivotal in the development of rural economies, and ultimately helping farmers to escape poverty. In Nigeria, cocoa production is paramount for raising farmers’ income and economic status. The commercialisation of subsistence agriculture can help to improve the capacity of actors along the value chain to participate profitably in the cocoa market. Cocoa was introduced to Nigeria in 1874 and has become a major export crop; Nigeria produces about 12 percent of global cocoa, making it the fourth largest producer in the world. The country currently produces about 385,000 tonnes per year, and this is produced mainly by smallholder farmers. 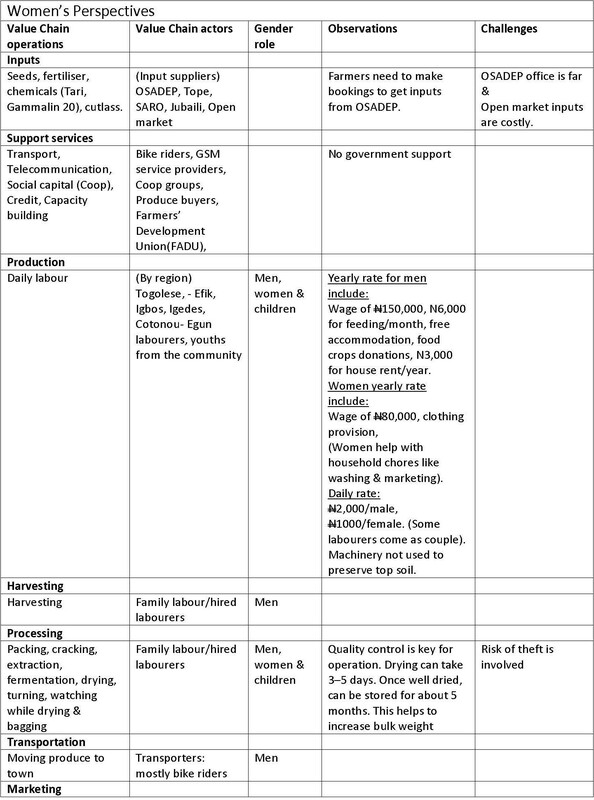 Men and women, however, play different roles along the value chain and therefore encounter limitations differently. Cocoa production is essential to the livelihoods of the people of Iwara, a rural community in Osun state – which is one of the major cocoa-producing states in Nigeria. Most of Iwara’s farmers have small (1–2 ha) and medium-sized farms (4–5 ha), which are often family-run. 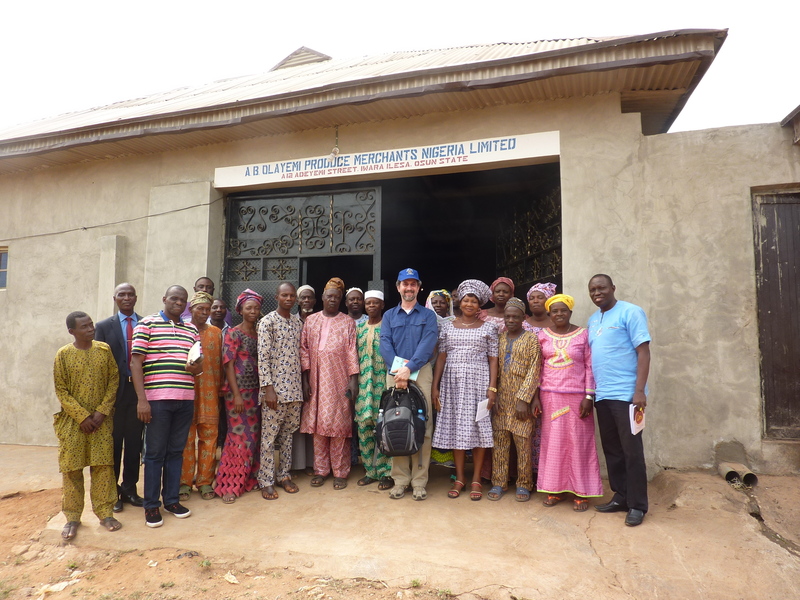 The APRA Nigeria Team, accompanied by APRA coordinator, John Thompson, visited the Iwara site on 12 December 2017 in order to interact with actors in the cocoa value chain, and gather information to inform APRA research and policy actions in Nigeria. The team met with locals working in the cocoa value chain – from producers to dealers – for a group discussion focusing on cocoa commercialisation and value chain activities, which was translated into the local language by APRA team member, Wale Oni. This was followed by a breakout session, where a mini- Participatory Impact Pathways Analysis (PIPA) was carried out with men and women cocoa farmers, to elicit information on the various actors along the cocoa value chain that will help to shape the pathway for any process of commercialisation. The gendered groups reconvened to compare notes, after which the group visited a cocoa storage centre and some nearby cocoa farms. The visit was quite revealing. 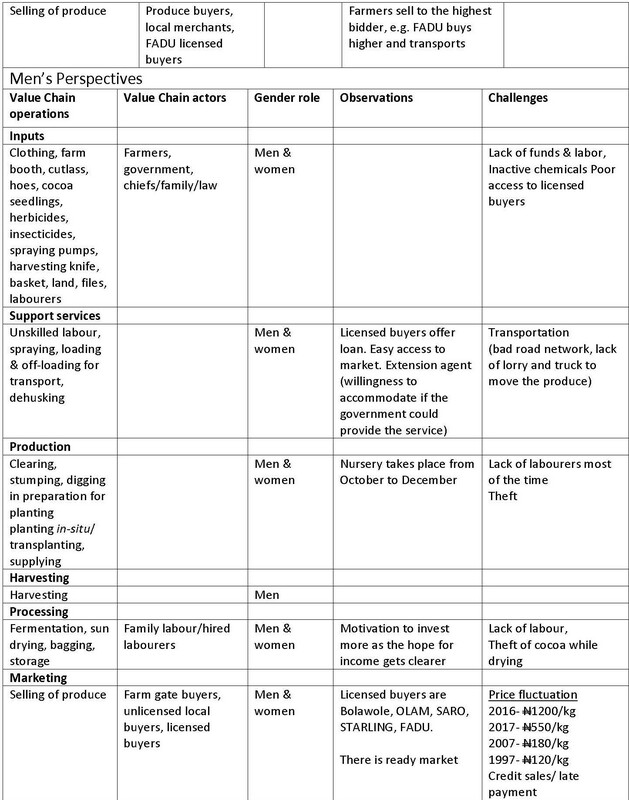 Of particular insight was the Venn diagram – a tool used during the mini- PIPA analysis to identify the actors along cocoa value chain activities; any gendered patterns emerging within Iwara’s cocoa sector; and labour dynamics in production, processing and marketing among the village’s cocoa farming households. 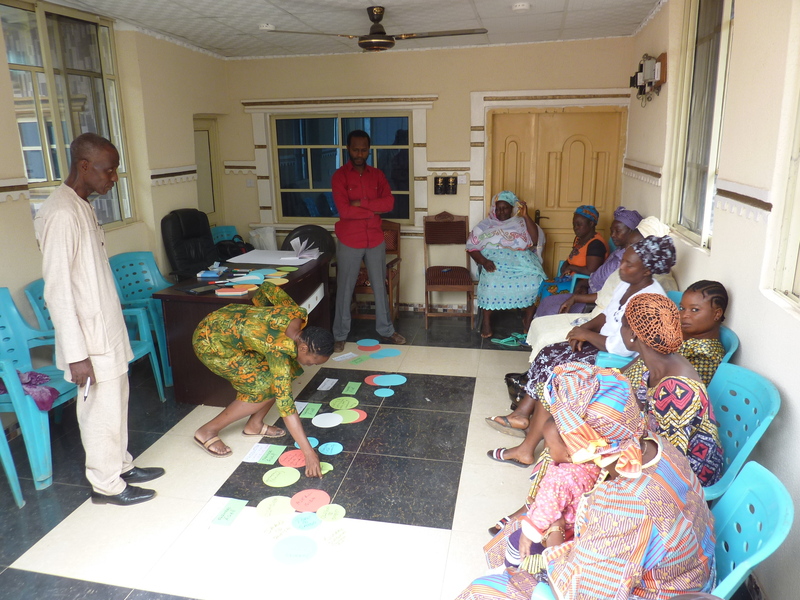 Male and female gender perspectives about Iwara’s cocoa value chain aligned in some ways. However, each gender’s views were more predisposed to their peculiarities. 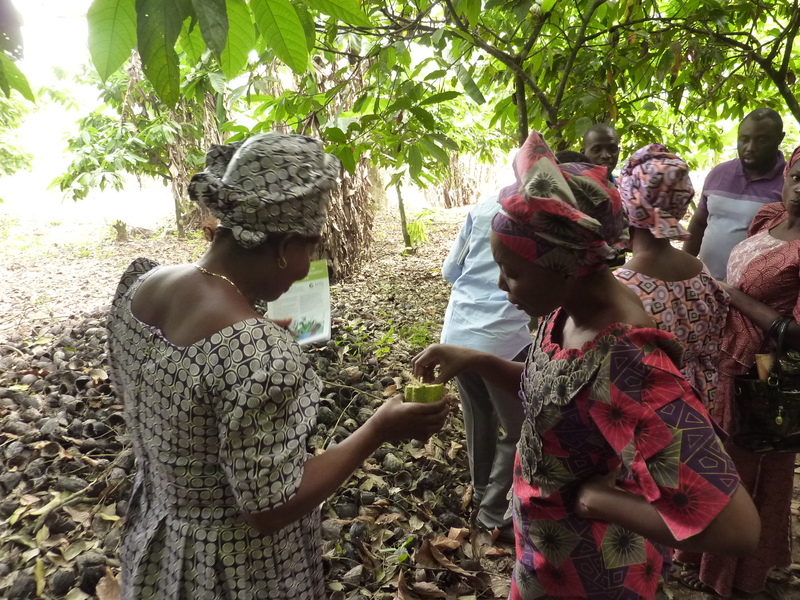 Generally, Iwara’s cocoa industry is becoming more commercialised, and this appears to be having generally positive effects for both men and women. The challenges identified, however, need to be addressed if the overall positive effects of Iwara’s cocoa sector are to be maximised.